Our readers know we like to keep up with innovations in diagnosing and treating allergic diseases, and we are happy to highlight the work of industry leaders who are either doing something so leading edge that the rest of the industry must play catch-up, such as the component testing made by ThermoFisherScientific and AD RescueWear, or newcomers whose products represent a legitimate advance on the way things are done, such as AsthmaSense, Asthmapolis, and Auvi-Q. 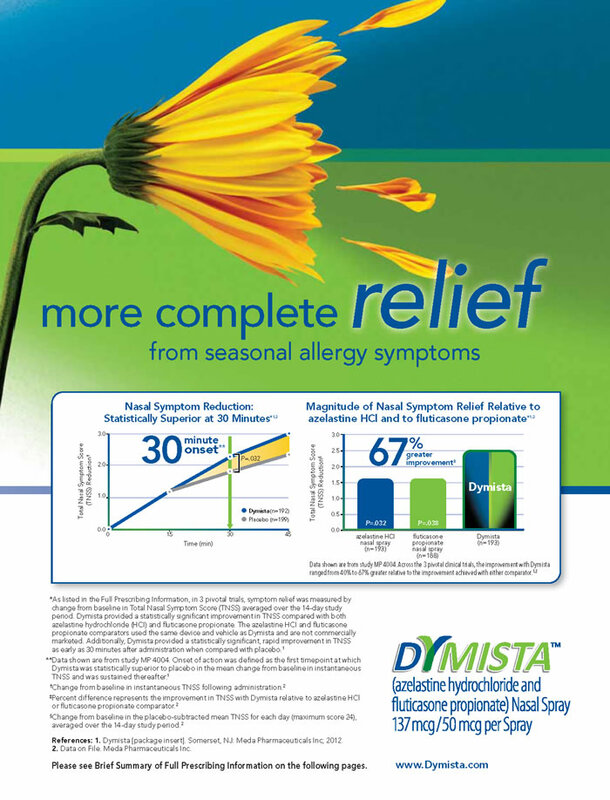 Thus, we alert you to the first combination therapy of an antihistamine and a nasal steroid, Dymista, for seasonal allergy symptoms, which we spotted as a sponsor of a recent meeting of the New York Allergy And Asthma Society. 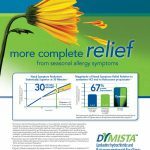 I asked Dr. Ehrlich about Dymista and he said that both because it is new and because it can be prescribed for 12 years plus, he hasn’t given much of it. Still, looking at the company’s literature there is much to recommend it for those whose noses continue to suffer even after they have used saline solution—our low-cost, low-tech favorite—and generic over-the-counter antihistamines. If you want both to control nasal allergic reactivity and inflammation, it’s easier and probably cheaper to do it with a single dose twice a day than two separate medicines each twice a day. The fewer moving parts and tasks, the more likely you are to comply. Thus, with combination asthma medicines like Advair and Symbicort, which contain both a steroid and a bronchodilator. The company’s own literature says that symptom relief from the combination therapy is substantially higher than from each component separately, and that it is also more effective measured at 30 minutes after use compared to placebo.